‘The man in black ‘ gains this sartorial description because his shoes, trousers, shirts and jackets were of that colour. The man is Johnny Cash, great friend of the late Billy Graham, music legend and highly honoured in US music circles,‘ He is back in the news, even if he died in 2013. In his lifetime Johnny sold some 50 million albums, recorded in excess of 1.500 songs, in the US accumulating 14 top of the chart hits, all with a bass-baritone voice that seemed so individualistic, and commanded attention whether he was singing a traditional hymn , something more attune to the hit parade or simply singing country. In popular music history Johnny Cash stands as one of the greats. Some would take this further and bring the Arkansas born singer into a wider cultural context beyond music. US, Post magazine writer Alfred G. Aronowitz needs few words to opine: “Johnny Cash knew how to talk to prisoners and presidents. He knew, as a matter of fact, how to talk to all America.” More in-common with general appraisal writer Dave Urbanski sees a ‘complicated’ Johnny as a “Six-string strummer, preacher, poet, drug addict, sinner, saint, victim, survivor, home-wrecker, husband, father and more.” Bono of U2 has been recorded saying: “Johnny Cash doesn’t sing to the damned, he sings with the damned, and sometimes you feel he prefers their company.” Writer Steve Beard sees him as a spiritual enigma who fears only two things in life: “God and drugs.” In his contribution to a book entitled “Spiritual Journeys (Relevant books) the same writer sees Cash one part outlaw and one part Old Testament prophet. Much of the ‘complicated’ Johnny belongs to his always precarious life-style which ran at the same time as strongly held Christian faith. His is no simple testimony. This American legend has been to an earthly hell and back – well, a few times. Addictions have threatened his life. It would seem dependency on drugs with the struggle to ‘come off’ was tangled with his understanding of Jesus. It was finding faith that saved his life. Cash died September 3, 2013 in Nashville. Discovery time has followed his death – a veritable treasure trove the result. It is the reason why Johnny Cash is finding his way into current music magazines and beyond, Son John discovered some 2.000 unpublished pieces of writing, and within this undoubted treasure trove some 300 poems and lyrics. One result - John’s sisters, Carlene and Rosanne have put together some of the material for a 16 track-album entitled Forever Words that was released in the UK on April 6 of this year. A range of known contemporary artists to include Elvis Costello, Kris Kristofferson, Willie Nelson and Alison Kraus take vocal slots. The music – song choice straddles many genres. John has engaged various writers. In retrospective terms of Cash and past Gospel catalogue a first call is the 1959 album Hymns. In-spite of the title it was not a selection of material you might hear in a well-ordered mainstream church. There were Cash compositions, and just a few ‘gospel’ and ‘spiritual’ numbers, such as track six, the familiar and much recorded “Swing Low, Sweet Chariot.’ One reviewer at the time, Richie Unterberger, saw some of the material possessing the “country-rockabilly bounce characteristic of his secular material.” Still, why should Cash change style or surely not adopt a sudden reverential manner, yet he does sing some of the songs in a manner that would have pleased his mother. It appears in early considerations of material there had been suggestion he might do something akin to the Elvis Presley frays into gospel-ish content. And so Cash would have sung ‘Peace in the Valley’ or even the monster pop smash of the early 1950s, ‘I Believe’ – a quasi religious song that gave American Frankie Laine eighteen weeks topping the UK pop charts. Author Hilburn says Cash did not wish to be seen as someone copying Elvis. Three years later there came his eleventh general album “Hymns from the Heart,” the second gospel release. It contained the Moody-Sankey favourite by Philip Bliss, ‘Let the Lower Lights Be Burning; and better known here as ‘Brightly Beams Our Fathers Mercy.” It was seen as containing a more traditional hymn/gospel feel than the previous first religious album. In so-called ‘secular’ land Cash found real positive vibes for the album At Fulsome Prison. Its success paved the way for a double album set and persuaded a seemingly resistant record company to issue The Holy Land. It was what the title said, in the sense that the singer took off for biblical land. Cash and his new wife June Carter went a-visiting sacred sites. Cash recorded his thoughts and these spoken memories and some gospel songs made up the 1969 release. The same process provides material on two later albums, the 1973 soundtrack The Gospel Road and in 2000, “Return to the Promised Land.” The former was no less than Cash filming his story of the life of Jesus. However these album references are given because arguably they are the more noted releases. Even a brief look at the Cash lengthy release catalogue sees “Sings Precious Melodies,”’ “A Believer Sing The Truth”, “Believe in Him,” “Return to the Promised Land’ and yes, “My Mother’s Hymn Book”. The latter was issued in 2003 shortly after his death. There are four yuletide albums: “The Christmas Spirit, “The Johnny Cash Family Christmas,” “Classic Christmas’ and “Johnny Cash Country Christmas.” At the same time some of ihs general releases have veered toward faith statement, as for instance the ”Man in Black” set. This feature as focussed on the man, his faith, and to a degree his music. It has not been forgotten – space is not endless – that he did have a political dimension to his life. Most known to those outside of the US is his work toward prison reform.In the US he was not happy with US involvement in Vietnam, although apparently not a draft-card-burner. He was part of a movement to help free US prisoners in Vietnam. Cash achieved a remarkable moment when in visiting Northern Ireland for a truce was called to allow a performance in a Belfast church, such was his popularity across the religious divide. For a moment leaders of the two factions sat at his feet. The next day it was back to bombing. Thomas Merton Bob Dylan and................Tony Jasper examines. Here is a book for all intents and purposes about an American Catholic Trappist monk who has resided at the Abbey, Gethsemani, Kentucky. He is a writer, theologian and mystic. His writings I have read and admired. Somehow I imagined Thomas Merton at all times and in all places a freedom fighter at the word barricades of injustice; intellectually, theologically, biblically aware with a rapier sharpness of mind, someone assembling deep thoughts on life and living, doing so moment by moment. Such is a degree of my naivety, even if a different respect still remains by the time I’ve been taken through Robert Hudson’s absorbing book The Monk’s Record Player by Robert Hudson (Eermans). I am to learn Merton has his personal problems and issues, inward fights, and emerges stronger for them. This is a lively writer with a tabloid journalist’s sense of ‘the story’ and an equally impressive clarity of expression, with an undoubted love for gossip, well, one with an intellectual edge, more TLS than say the Sun, with a greater word allowance to say things. The other person Merton encounters has effect of a different kind. He discovers Bob Dylan, and through Dylan, Joan Baez who has black hair just like Margie. In a moment of forgetting Margie he says of the young Joannie: “I love her. I know she loves me too.” In another part of the book there is the realisation that Joannie might not be on this wavelength. The text tells us that his extra-curridular activities seem to gain him disaproval, but he survives, partly because no one doubts his exceptional abilities, let alone his spiritual perceptions. Merton discovers and adores the Bob Dylan song and poem catalogue. He speaks of joyful, intense listening to the songs “absorbing the offbeat, avant-gard prose, and relishing the eccentric phrasings. It was an artistic honeymoon.” Fascination with Dylan would push Merton into composing his own experimental verse, one of which was Edifying Cables, a book of eight-eight poems. Hudson sees Dylan-like images and poetic devices “seeping into every corner,” of his compositions. Dylan fans will find much food in his reflections on Dylan lyrics. So here is an absorbing book with many atrractions. The detailed notes at the book’s conclusion are impressive, although of course it makes you aware that this excellent writer has to tell much of his story from assidiously trawling through other writings and then translating it effectively to make you feel he was there at all times and in all places. It’s simply one of those books that every Christian should read. The sub-heading to the book Against The Grain (Amos Trust) tells well the content: “A mixture of stories. theology, wisdom, music, humour – all building together to say something really important....but gently.”As Eamonn Andrews the TV man of old would say:‘This is Your Life” and the subject in this instance is the remarkable Garth Hewitt, as told by the man himself. At root, Garth is a clergyman, but the Anglicans do not seem to mind their ordained wandering. In Garth’s case it’s travelling a great deal of the world where he has sung his Bible based songs that see him take a stand against racism, issues of militarism and war, and poverty. Along the way these thoughts have coloured endles songs that are found on some forty albums. On occasions across the globe he has sung for Tearfund, especially when the great Christian ambassador George Hoffman was at its helm. Garth founded the Amos Trust with as he puts it on page 80, the name springing from the 0.T. and Amos, and within that Old Testament book, chapter 5:24, the only biblical area where music is criticised – and the critciism comes if the musicians ignore the poor (5”23). Has to come down, it has not, and Hewitt comments:” You keep thinking things cannot get any worse (P105), and then they do get worse.”He takes us into the strong Christian witness in Jerusalem. The slums of the world come rearing their head in his commentary. He quotes our David Haslam on page 127 when it comes to financial matters, and inequality, and where Mr Haslam envisages Jesus upending muti-million dollar super-yachts. In refreshing manner and humility the overall text describes his encounters with the likes of Mother Teresa, Archbishop Tutu, Bishop Trevor Hudlelstone, Sir Cliff Richard, Yasser Arafat, Ernesto Cardenal who built the Church of Liberation, and among numerous others, and not least, Jesse Dixon, Pat Boone, and The Boomtown Rats, of Bon Geldof association.In Chapter fifteen he takes us to South America, to New York amd Riverside Interdenominational Church where Martin Luther King gave his “Beyond V ietnam – A Time to Break Silence” Address. There are many things that make this Garth especially notable. For one, he has joy in theology and indeed expands on this in chapter nine. A second plus lies in his total disregard for boundaries or rather he takes the Gospel into any and every situation. A third rests in his love for the dispossesed and forgotten. Oh, he does touch on ministry here in the UK, on Greenbelt and Spring Harvest, and ‘ordinary’ churches. He does profess hthe strength that comes from wife Gill, only in passing to his ever present ill-health, including along the life path, cancer. The book looks rather good in appearance and comes with some beautiful pictures. Great stuff! Both reviews by Tony Jasper first appeared in The Methodist Reccorder. Running down one side of my shelving space that hosts a considerable library of gospel music, the name of Sister Rosetta Tharpe is prominent. For the most part she is one of the forgotten “greats’ in black Gospel. Suddenly, unexpectedly, this neglected artist finds herself lauded in the May music monthly Mojo, as it reminds its readers that there is life in Gospel, and in Rosetta’s case writer Paul Trynka wonders why for the most she has not attracted the attention she is due. I assume he means religious quarters but I’m sure to he means to the overall record and music world. Horace Clarence Boyer in his book The Golden Age of Gospel (University Of Illinois Press) says church people could not get their heads around her life-style where she would attend services with COGIC saints and within a few months be sharing the music floor with the supposed worldly jazz stars like Count Basie, Benny Goodman, and Cab Calloway. Some might have rejoiced but sadly she had to undergo a degree of ridicule, and from some an attempt to scandalise her name. Bil Carpenter in his extraordinary book Uncloudy Days – The Gospel Music Encyclopedia (Blackbeat, San Francisco) describes this 1921, Cotton Plant, born Arkansas, singer-musician “as perhaps the original gospel crossover artist.” She took Gospel to secular venues of the time, and for that attracted hostility from some of the redeemed. She was a long-time favourite of another Arkansas artist – a certain Johnny Cash. Both knew the perils of knowing fame, and the demands of the ‘biz’ and fans, and at the same time professing Christ. Then again there is the religious-church dimension. The two lived with inward battles, aware of the strains and stresses that can come in the Lord’s work when it doesn’t fall into so-called ‘church’ acceptable territories. Other admirers include Little Richard and Jerry Lee Lewis. In Rosetta’s lifetime it is easier to say why some people looked askance. She brought her faith an music into an existing narrow religious domain. For many she was too way-out musically, and then again ‘worldly’ in her personal choices. Yes, she sang Gospel, but to that you can add blues, jazz, and the boogie-woogie, as it was called, that delighted the dancers of the 1930s and 1940s, but not some Sunday worshippers. Sister Rosetta’s musical mix, accompanied by playing secular venues, shocked the members of the sanctified church to which as a young talented person, with her mother, she ministered. In common with others who believed the call of church elders and preachers to go out and gather souls she failed to realise that they did not totally mean what they said. What they had in mind, and countless people since, was ‘from a distance’ evangelism – the thought of entering the dance hall of sin was in itself a sinful thing to do. But then, how were you to evangelise? Pass. From safety at the tabernacle prayers could be said for sinners..
Also along with gospel singer and contralto Marie Knight there was born the perfect gospel duet. Rosetta liked medium fast and fast songs. She also played the guitar - for some people a woman should no more play the devil’s instrument as to drive a bus. Her guitar playing attracted much interest. As Horace Clarence Boyer describes this way - it was the case of first she would strum some chords to solidify the harmony; then some elongated phrasing of singles tones. The uniqueness in which she brought would lie not the single tones in themselves “but that where one single tone would normally suffice, Tharpe uses four”. For each beat, then, she plays four notes, giving each bar sixteen different tones – for a guitarist not the easiest of procedures. For a time her “popularity became greater among non-saints than with saints.” At least in some form the Gospel was heard. Her mum was known as Mother Bell, a travelling evangelist with Pentecostal leanings who set up new churches wherever she travelled. When she was six or so years Rosetta was “out there’ at the front of the worship area with a mix of singing, dancing, and by all accounts even ability on piano and guitar. She was a child prodigy. It was part of the Pentecostal mix that was not afraid to take the world’s music and its rhythm, and baptise it in the name of Christ, but only in church you understand. In-common with artists today such as the beautiful singer Mica Paris or the strident tones of Lavine Hudson the church people say you sing in church, you don’t go venturing into Babylon. In terms of her recordings generosity rules the day. When it comes to the number of tracks “Up Above My Head”(Complete Blues) has 22 tracks, and for a 60 track affair, there’s a three CD collection that bears her name (Big).Paul Trynka in Mojo names what he terms five essential tracks: ‘That’s All” (from Various – Spiritual to Swing ) on Vanguard. Three issues on Proper: from the album “The Original Soul Sister” are ‘My Journey to the Sky,’ ‘Strange Things Happening Every Day’ and ‘Four or Five Times’. Last, the much recorded ‘Didn’t It Rain’ from “Live In 1960,” here, it sparkles. In his second look at newspapers and magazines Tony Jasper focuses on past and present Christian youth orientated material, and with brief explanation admits the now deceased Third Way into this classification. In the early 1980s a number of prominent young Christians, media employed people, met with the aim of devising an exciting late teens magazine. These were people whose work was being carried in existing general teen oriented magazines. The idea was to create a lively entertaining magazine that would be underpinned by Christian conviction. The group had been established as a positive outcome from the Pop Culture group at the Nationwide Initiative in Evangelism Congress in Nottingham. They felt many young people would welcome a magazine that took them seriously, and had a scale of values which did not assume that human behaviour is merely governed by egotistical designs and overall self-gratification. It went as far as a dummy issue but ultimately failed when the necessary finance could not be found. The sale aim was for the then high selling overall print market that was stocked by the likes of chains Smiths and Menzies, rather than your Christian bookshop. However to the magazine Third Way. It was the then editor of Crusade and publisher John Capon who decided to launch Third Way in 1977. Derek Williams would become the first Editor. 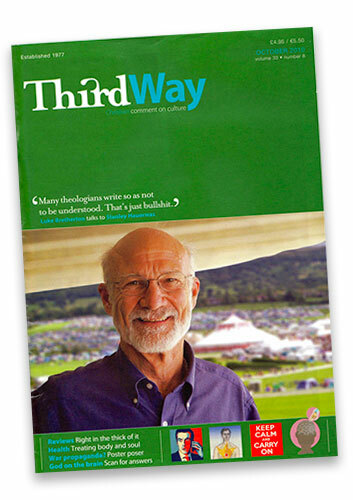 April 2016 saw the last edition of Third Way. To be sure, this was a magazine for all ages, but it had a young staff, young ideas, and at base it reflected a desire to bring into play Christian based reflection on contemporary issues of the moment, plus the ‘arts’ in general. Films, music, books and television rubbed shoulders with topics of the moment such as the environment, sexual identity and economics. Major names expressive of many trains of thought were interviewed, along the way between 1977 and 2016 the list included Gerry Adams, Jurgen Moltman, Richard Dawkins, Tracey Emin, Theresa May, Tony Blair and Richard Branson. It gave the magazine notice beyond so-called religious territory. At one time it had 10.000 readers. In 2007 it was acquired by Hymns Ancient and Modern which also owns the Church Times, and to their credit they enabled the magazine to remain, losses or no losses, but sometime, someplace, in some room, enough was enough for no organization can take unlimited financial haemorrhaging. In appearance it had similarities with the New Statesman and The Spectator. I cannot recall a poor issue, arguably it was slightly dull at times; more of an edge and some anger might have been welcome, but it had other virtues of good reflective writing, and for a relatively low readership a great sense of being unafraid to chase after leading figures to fill its pages. The Evangelical Alliance still publish existing Idea, in 2003 its editor Phil Seager and contributing editor Gill Troup. At that time the content was largely orientated toward young Christians, whereas now it seems an interesting general magazine for all ages. Wikipedia mentions Third Way, Ship of Fools and Greenbelt in the same breath when it comes to Christian publications that had a younger appeal.. The second exercises a degree of levity on to the safe and sedate expressions of contemporary Christian faith. On its C5 print front cover it carried the words “the magazine of Christian unrest.’ These days it appears on-line, often amusing, on occasions offering trenchant observation on matters some take far too seriously. For some time it has featured ‘mystery worshipper’ in which someone has reported on how at a particular church they have found the worship. Greenbelt people once issued Strait, outside of their highly professional programmes for the Greenbelt Festival. Strait in early times had the appearance of Rolling Stone. Many of its writers like the prolific Martin Wroe, and the occasional ‘myself’ were already writing oceans of copy for national papers and especially music magazines. It went from newspaper print to magazine format, still a good read, but no longer rubbing shoulders in style with the US journal, or say a highly regarded music paper reputation such as Melody Maker, Sounds and NME. Music was not its sole focus but it was arguably its major subject. In similar fashion but more shall we say evangelistic came His but life was short. The magazine Everyman came out of the Jesus Family commune in Kent. It was a British version of the American Jesus paper, Street Level. Fortunately it did not come from an ecumenical body and unlike Tempo - the inter-church youth publication that for a time I edited with Myra Blyth - it was free from denominational interference. Periscope was another journal to emerge from the British Council of Churches and where Myra was for time its youth officer. In similar inauspicious manner to Buzz, there was an attempt to produce a magazine that would specifically cover the Arts. This was Gallery under the editorship of Andy Kelso. Its music editor was Dave Peacock. Peacock was involved with C.A.P. – the Christian Arts Project based in Birmingham. Gallery 2 in 1974 reported sad times for a once lively organization that had begun two years previous. At the time it had 400 members. It had sponsored arts events of various shape and sizes and particularly ran workshops. The issue mentioned contained positive support from various organizations, including the Christian Songwriters Fellowship. Praise was directed at the magazine Gallery and in essence saying that it answered a great need for a Christian paper covering the whole realm of the Arts. Less enthusiastic was a note about the production standard of the magazine. World Outreach ventured into the market with Evidence magazine, The missionary society said their magazine was being read throughout the British Isles and according to readers it was providing inspiration, help, challenge, comfort, encouragement and enlightenment. Various other publications attempted to meet the needs of a largely young-ish Christian market. Repercussions launched in 1987 and said farewell after just one issue. Certainly it caught the scene of the time and carried features on Gloria Gaynor and Lavine Hudson. Repercussions promised much. It was well conceived. Christian Music came from Herald House, the publishers of one of the all-time Christian newspaper ’greats’ of Christian based publishing Christian Herald.. Herald house was fast expanding with two other journals in its stable, Christian Woman and the short-lived teen publication JM. It was more designed for the Christian musician than a more general readership of those who wanted coverage on groups and concerts. Movement was a magazine that described itself as ‘the Student Christian journal’ and concentrated on largely political and social events. It carried news on various SCM groups at further education centres. SCM would move its headquarters from leafy Golders Green to Eock Court, Wick, Bristol with intent of establishing an effective open-style commune. For a while there was Dovetail and for Christian punks – Gob! The more social-political radical came with Roadrunner. In the mid-Eighties, Scripture Union launched Jam, a cover price 75p and a print run of 30.000. 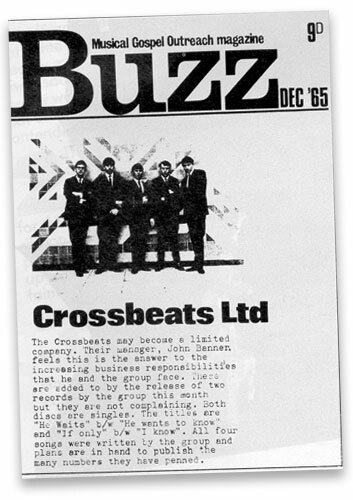 Cross Rhythms was as an exceptional magazine Its content provided a rich vein of informed and quality material, The magazine’s shortish history in print (see online)is a testimony to a convert Tony Cummings. Cummings was known for his amazing lnolwedge, especially of black music. Like many professional communicatory forms that promise wide influence it suffered from a lack of support in the Christian constituency that talks but often fails to deliver, encourages, but runs away from the harsh realities of real life. .It was launched in 1990. Cummings found an ally in Mark Golding, who ran a small Birmingham –based print company. Cross Rhythms had a launch capital of £50.000. More revenue was needed and Christian commitment was strong from other sources. Sadly it would eventually become the victim of financial print pressures, and the lack of advertising and sales. Aspects of Cross Rhythms can ne caught on line. Its man emphasis is on Christian music. Autumn, 1974 saw a new chapter for a publication designed for Christians working in the arts. In 1969/70 a fairly short-lived print journal entitled Salt had appeared, but mid-way through the decade it promised to become a regular publication. The credit list bore such names as Meryl Fergus, Tony Wales, Malcolm Doney, Steve Turner, Will Richardson and Suzan Davies. This was a rich period in which talented Christians were exercising considerable influence in professional media fields. While Buzz carried music news and reviews a country and western devotee and overall music fan by the name of Paul Davis felt he could provide a greater catalyst for Christian music. He founded New Christian Music, and like many non-mainstream efforts, it would be financed from his own pocket, some friends, and that prayer and blessing would follow. Well produced with a great guide to the new Christian music, and I have to admit it carried a general music scene commentary from me,. NCM soon established itself. Paul Davis, apart from his musical loves, was involved in publishing, and writing articles and reviews for many general magazines and newspapers. Buzz or no Buzz he felt there was a gaping hole when it came to Christian music, and that as an interest group it was not being served or encouraged. Partnership (CCP). Kingsway would publish Worship Together, a resource journal for worship leaders, pastors and musicians iwth the accent on the mew songs with a pervading air in profiles and pictures on young people. Today the Christian youth scene, and the various markets feeding in to, and inspiring, seems a pale shadow of recent time. There is not the excitement and creativity that once existed in the print world. 0bviouly new technologies have swept all before them. In addition to holding the sculpture for one year the winner will receive a cheque for £100. There is a monetary reward of £75 for the second and £50 for the third. The winning entries will be posted on our web site www.artscentregroup.co.uk, *See T & C’s on next page. should in some way spin off the sentence: ‘Those moments we always come back to’. Entries should be sent via email to tony.jasper@btinternet.com or on a single sided sheet to Tony Jasper, Milsrof, Eglos Road, Ludgvan, Churchtown, Penzance, TR20 8HG, Cornwall. Do ensure you have a copy of your entry. CLOSING DATE FOR ENTRIES IS 4 JUNE` 2018. Send to tony.jasper@btinternet.com or in hard copy form. have included some well known writers and editors, as well as several with publishing contacts. They have included Stewart Henderson, one of the UK’s leading poets and known especially for his long running BBC Radio 4 series of ‘Questions. Questions.’ and Adrian Plass, best selling author. Moira Andrews, Education Lecturer with children’s and adult’s poems in Publication.Christine Smith, Publishing Director/Manager of Canterbury Press. Isabel Hariades, freelance with Harvey Miller, Thames and Hudson, Macmil-lan, & Jonathan Cape publishers. Heather Martin, Associate Professor of Religion at Principia College IN. Dr Gemma Goodman, Associate Fellow, Department of English and Compara- tive Literary Studies, Warwick University. Garry Tregidga, Associate Director of the Institute of Cornish Studies. Do not put your name on entries to ensure anonymity in the judging, but ensure your name and poems are listed on the entry form. Thank you! Cost: £8 one poem, £12 two poems, £15 three poems. Students and Under 21: £5 one poem, £10 two poems, £15 three poems Please state course & institution. C. HOW DID YOU HEAR ABOUT THE COMPETITION?